Guernsey No. 17 (2000 - 2003). Scott Freeborn was a blonde-haired left footer originally rookied by the Blues in 1998. 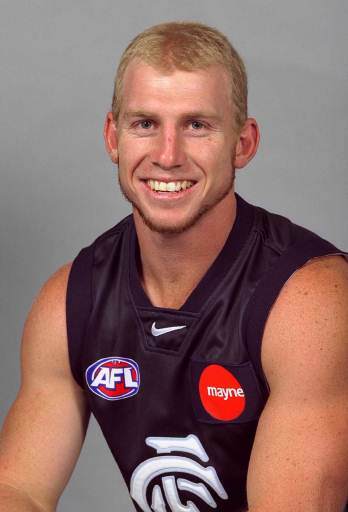 Brother of Collingwood / Kangaroo player Glen, Scott played 48 games for the Blues between 2000 and 2002. He was recruited from Port Adelaide Magpies, but also played for Woodville-West Torrens. Freeborn's time on the rookie list was spent on the wing and half forward, in the No. 46 guernsey (1998 - 1999). His form was sufficient to be promoted by season 2000, when he made the seniors for the Round 5 clash against the Bombers. Over the season, he played as a defensive midfielder where his strength and endurance were most useful. Tight as a player, Freeborn also was an oddity in that he would slice his preferred left foot often, kicking the occasional airball. In 2001, Freeborn played almost the entire season of 23 games in defence, including finals performances versus Adelaide (win) and Richmond (loss)- missing just one game due to a thigh injury. Come 2002 however, he would manage just 7 games- missing the start of the season with an Achilles injury and suffering a broken collar bone mid season, which would force him to miss the remainder of that year. Osteitis pubis and a debilitating foot injury would then severely impact on his career, forcing him to miss the whole of season 2003 without playing a single game and he was then delisted. Contributors to this page: molsey , Bombasheldon , WillowBlue , BlueWorld , true_blue24 , PatsFitztrick , Jarusa and admin . Page last modified on Saturday 22 of March, 2014 17:13:10 AEDT by molsey. 1973 - Big V Rep. Alex Jesaulenko.